There’s one question we have been asked on an almost daily basis – do we have a cannabis seed variety suiting the demand for a low-THC cannabis variety? Well, SENSI #41 AUTO CBD is the one that comes closest! Swiss Dream, which we’ve crossed with our own Skunk #1, is a very special strain. Its THC levels are comparable with those of industrial hemp strains, but this has been achieved by careful breeding, not by introducing hemp into the gene pool. With a THC content of less than 0.6%, SENSI #41 AUTO CBD qualifies as an industrial hemp variety in Switzerland and Italy. And with a THC:CBD ratio of 1:30, it’s an extremely attractive breed to anyone interested in the benefits of cannabidiol (CBD). Suitable for growing indoors, and outdoors in virtually all climates, SENSI #41 AUTO CBD has an average height and delivers extra-large yields. The Sensi #41 Auto CBD strain has large proportion of Indica genes in its background. Sensi #41 Auto CBD will have a relatively long flowering time. Sensi #41 Auto CBD will have relatively small height gain during the flowering phase. Sensi #41 Auto CBD can produce a very large yield, but may require a little extra care to achieve their full potential. 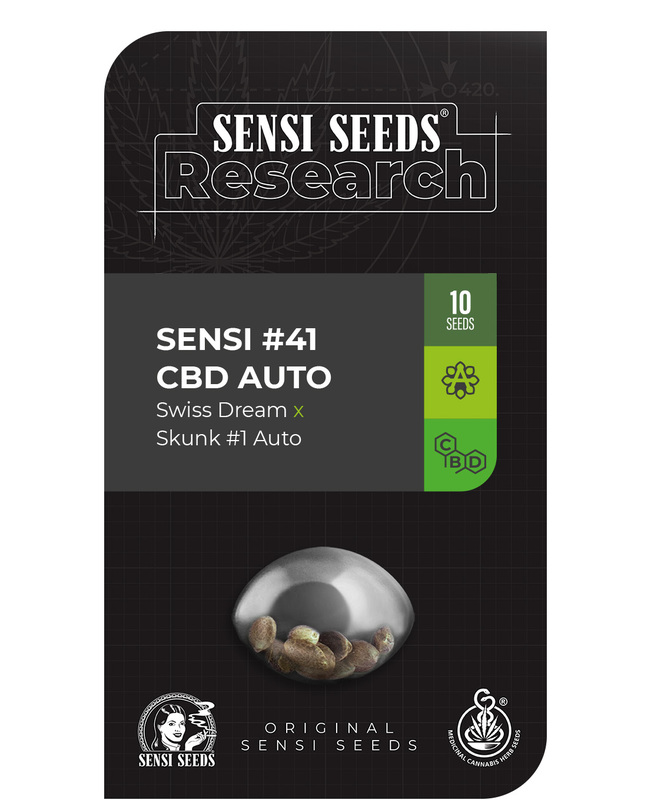 Sensi #41 Auto CBD Seeds is added to your shoppingcart! Sensi #41 Auto CBD Seeds is added to your wishlist!